Chemical Guys Swift Wipe Waterless Car Wash is the next generation waterless detailing system. Swift Wipe Waterless Car Wash cleans, shines, and protects without installing any swirls or scratches. The waterless detailing system finishes with a coat of optical gloss enhancers to ensure your car is getting washed and pampered in one step. Chemical Guys Swift Wipe rapidly and safely lifts away dust, dirt, and grime leaving behind a high-shine protective layer. Whether you're gearing up for a car show or need a quick clean before heading out, Swift Wipe Waterless Car Wash makes washing your car fast and easy. Use Swift Wipe Waterless Car Wash on painted surfaces, wheels, glass, clear optical plastic, textured plastic, bumpers and window trim, exhaust tips, engine bays, door jambs, and more. Choose Swift Wipe Waterless Car Wash to have the latest innovation in waterless washing technology at your fingertips. Now you can give your car the ultimate clean anywhere with Chemical Guys Swift Wipe Waterless Car Wash. This next generation waterless detailing system gives you the ability to wash your car without the need for water. Choose Swift Wipe Waterless Car Wash to wash your entire car no matter where you are - just spray and wipe to wash and protect anywhere, anytime. Chemical Guys Swift Wipe Waterless Car Wash safely removes dirt, debris, and contamination from the vehicle surface for a scratch-free finish. Swift Wipe Waterless Car Wash is formulated with slickening agents that provide lubrication on the surface of the vehicle for a fast, easy, Swift Wipe of dirt and contamination. Not only does Swift Wipe Waterless Car Wash provide a fast easy wash, but it leaves behind a non-stick UV protective coating on all vehicle surfaces for added protection against the elements. Keep a bottle in your trunk, bike, or motorcycle for trips and adventures. Make fast work of cleaning large surfaces like airplanes and RV’s as easy as a Swift Wipe. Save water and time with Chemical Guys Swift Wipe Waterless Car Wash, it will change the way you keep your car spotless. Sometimes regular access to water and a hose is not easy, but your car still needs the attention of a full wash. With Swift Wipe Waterless Car Wash you can give your car a full wash and shine without the need for water. Chemical Guys Swift Wipe Waterless Car Wash is safe to use on painted surfaces, wheels, glass, clear optical plastic, textured plastic, bumpers and window trim, exhaust tips, engine bays, door jambs, and so much more. All these parts will not only be clean, they’ll be magnified with advanced gloss enhancers to ensure that your car is always glistening under the bright lights. Through years of research and development, Chemical Guys can now unveil the end result of passion and dedication. Look to the future with the next generation of waterless washing by swiping the multi-functional Swift Wipe Waterless Car Wash spray. A newly-washed car is a thing of beauty, but unfortunately, the clarity and shine of that vehicle doesn’t last as long because it lacks protection from the harsh elements of the road. With every spray of Swift Wipe Waterless Wash, you are finishing off with a coat of optical select spray sealant to enhance shine and durability against the elements. The spray sealant protects vehicles until the next wash, and enhances and strengthens any existing wax or sealant coat. For prolonged protection and shine follow up with your favorite Chemical Guys sealant and or wax. Don’t just wash your car - protect, maintain, and enhance any vehicle with Swift Wipe Waterless Car Wash.
Dust, dirt and debris cloud the paint and endangers the sensitive finish by littering the paint with micro abrasives that can install new scratches. With Chemical Guys Swift Wipe Waterless Car Wash, you’re able to restore that warm, slick, show-car shine by cleansing the paint of any road-borne contaminants, and adding a rich unmistakable shine that every detailer desires. Specialty gloss enhancers infused deep within the formula allow for a brighter shine and enhance the wet look on any vehicle. Now the deep reflection and depth of gloss enhancers can be taken, and used at any time your garage queen needs a quick touch-up. Make sure your car is eye candy before and after you hit the road by using Chemical Guys Swift Wipe Waterless Car Wash to upkeep your instrument of beauty. 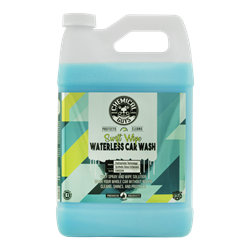 Swift Wipe Waterless Car Wash is ready to use straight out of the bottle and does not require further dilution to clean any vehicle.